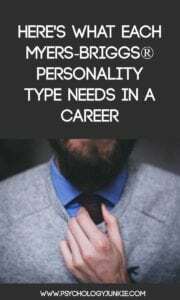 I get asked to write career articles for different personality types every day. Many people use their knowledge of type to try to find the right career or explore job opportunities that cater to their strengths. But I’ve always been wary of writing career-focused articles because I’ve seen SO many bad ones out there that say certain types can’t do certain careers well, etc,. So over the last few months I’ve spent a lot of time researching, and thanks to the help of my ever-faithful MBTI® Manual, I’ve been able to find some pointers for each type that I think are useful and not limiting! So what 3 things do you really crave in a job? Let’s find out! ISTJs want security and a clear structure in their career. In a national sample, they placed high value on financial security and liked work environments where “Everything is done by the book” and where everyone was “toeing the line”. If ISTJs are working for a company they want to know what’s expected, they want clear, specific guidelines and they want everyone to do their part. Having a consistent daily routine and structure helps them to feel comfortable as well. If they’re working for themselves they can be wary of hiring employees because they have a hard time finding individuals who are as detail-oriented and painstaking in their work as they are. ISTJs show occupational trends in management, administration, law enforcement, and accounting. ISFJs, much like ISTJs, need a stable and secure future in their career. In fact, according to the MBTI® Manual, they ranked highest of all the types in needing job security. They also were one of the three highest types who wanted clear structure and no expectation for working extra hours. ISFJs are very loyal, diligent workers and they enjoy jobs that let them make a difference in the lives of people. This is probably why they are overrepresented in the education field. In fact, there are more ESFJ and ISFJ elementary school teachers than there are of any other type! It’s important to them that their job is well-organized, that there’s a daily structure and routine, and that everyone is doing their part. ISFJs show occupational trends in education, health care, and religious fields. ESTJs are competitive and hard-working individuals who are actually the second-highest earning of all the personality types. In surveys they almost always list having a stable and secure future as their most important feature. They also want to have a clear structure with clear responsibilities. They are team players and enjoy working with a variety of people, as long as those people are doing their part and aren’t slacking! In fact, ESTJs are one of the three highest types who value “Toeing the line” and “Going by the book” in their work environments. ESTJs enjoy a variety of tasks and enjoy opportunities for advancement and proving themselves. They are motivated by achievement, competition, and financial security. ESTJs show occupational trends in management, administration, finance, and law enforcement. ESFJs are all about helping others and their community when it comes to their careers. According to the MBTI® Manual, the most important feature of an ideal job for an ESFJ is the chance to be of service to others. They also prefer work environments with “Toe the line expectations”, “Clear Structure”, and “Loyalty and Security”. They tend to be very committed, hard-working employees, especially if they work for a company that improves the lives of people. They tend to feel under-stimulated and de-motivated in careers that offer no improvement to society or where they are forced to work alone for long periods of time. They are usually very social, and enjoy getting to know their co-workers and being part of a workplace community. It’s very important to them that they like the people they work with and can find friendship in their careers, and not just a steady paycheck. ESFJs show occupational trends in education, health care, and religion. ISTPs are highly independent individuals, and this translates into the workplace where they value autonomy and independence. They want a job that allows them to do a variety of tasks while staying mentally challenged and creative. The last thing they want is a repetitive desk job where they are forced into the same routine day after day. Security is important to them, and competitions and opportunities for achievement stimulate them and encourage them to do their best work. They are good at multi-tasking, solving problems, and doing hands-on active work. ISTPs show occupational trends in skilled trades, technical fields, agriculture, law enforcement, and the military. ISFPs are very autonomous individuals who crave a great deal of independence in their work. They also like having a clear structure and knowing what’s expected of them. The MBTI® Manual states that ISFPs ranked lowest of all the types in valuing “achievement & accomplishment,” “education & learning”, and “being creative” in the workplace. But I find this surprising because it doesn’t match up with most of the ISFPs I’ve met and spent time with as a practitioner. Many of the ISFPs I’ve known have been drawn to creative fields and work, and many of them seem to enjoy artistic career fields. So this is one area where I’m not sure I agree entirely with the manual. I’m not sure how many ISFPs were part of the sample or case study either, so perhaps there just weren’t enough to get a clear picture. ISFPs like a variety of tasks and they tend to be drawn to practical fields where they can be of service to their communities. Sitting still at a desk doing the same things day after day holds very little appeal to them. They show occupational trends in health care, business, and law enforcement. ESTPs are highly independent and competitive in the workplace. They like having a variety of tasks and being able to dabble in many different opportunities and projects without being confined to one field. They will get really bored if they are stuck at a desk doing the same thing day after day. While they like having a clear structure, they tend to be under-stimulated by a repetitive routine with a narrow scope of activity. They are motivated by independence, achievement, and prestige. They like having opportunities to prove themselves and make it on their own. In fact, many ESTPs are drawn to entrepreneurship because it lets them be their own boss and compete with themselves and others. ESTPs show occupational trends in marketing, skilled trades, business, law enforcement, and applied technology. ESFPs bring enthusiasm and a love of people into the careers they choose. They want a job that will allow them to make friends while also providing stability and security. They tend to live more for their non-work hours and are dissatisfied with a lot of the stress, mundanity and prestige-seeking involved in the workplace. It’s very important that ESFPs enjoy the people they work with and respect them; if they don’t have this, they’re likely to leave a job early on. They tend to enjoy jobs that let them inspire other people, and that give them opportunities to work on their feet. Their motivational, fun-loving nature is probably why they are overrepresented in child care and coaching. ESFPs show occupational trends in health care, teaching, coaching, childcare, and skilled trades. INTJs seek jobs that let them use their creativity and originality to make a difference in the world. They are one of the three highest types in liking environments with “variety of tasks”, as well as favoring “clear structure” and “independence & achievement”. INTJs aren’t drawn to repetitive or simple jobs. They want something that will challenge them and utilize their intellectual powers and strategic thinking abilities. They like careers that give them the chance to achieve far-reaching goals and they tend to be on the competitive side. They care far less than other types about socializing and prefer to work independently rather than in large groups. INTJs show occupational trends in scientific or technical fields, computers, and law. INFJs want careers that will allow them to use their creativity, originality, and compassion to make a difference in the lives of people. They like having a variety of tasks and feel drained by repetitive, mundane activities. They also enjoy having a clear structure and being able to be independent and achieve goals autonomously. They are usually strategic and are good at figuring out how to reach goals that will impact people in a positive way. In a national sample, INFJs were among the top four personality types in valuing “spirituality”, “learning”, and “community service”. They were also the type that ranked lowest in valuing “Prestige”. INFJs show occupational trends in religion, counseling, teaching, and the arts. ENTJs are extremely ambitious, independent individuals who are considered the highest earners of all 16 personality types. They ranked highest of all the types in a national sample in liking work environments with a variety of tasks, working with people of different backgrounds, and having international opportunities. Achievement, creativity, and chances to contribute to society are all important factors to them. They want a job that means something in the big picture, and they are extremely unsatisfied in careers that involve repetitive, detail-oriented work. They like to work with big-picture concepts and they want the opportunity to explore original ideas and strategies. They tend to enjoy being their own bosses because this gives them the chance to be ambitious without limits or having to answer to someone else’s bureaucratic rules. They also like work environments that have a clear structure. Occupational trends for ENTJs include management and leadership. ENFJs want a career that will allow them to use their insight and originality in a way that will help others. Teamwork is important to them as well, and they’re most satisfied working in diverse communities with a variety of people from different backgrounds. They like a variety of tasks and usually veer away from repetitive, detail-oriented work in favor of big-picture, creative ideas and interactions. Who ENFJs work with is almost as important as what they do; friendships at work are important to them. They’re far less concerned with salary and promotions than with opportunities to learn, take responsibility, and contribute to society. In a national sample, ENFJs ranked highest of the 16 types in valuing “Education, learning” and “Community service”. Occupational trends for ENFJs include religion and the arts. INTPs want a job that will utilize their creativity and originality. They also highly value independence and autonomy and will hate a job that forces them to constantly interact with other people or where they are micro-managed on a regular basis. They are one of three highest types liking work environments with international opportunities, and advancement/pay but not job security. They are not generally as concerned with job security as many other types, and are willing to take more risks to earn a higher pay grade or to do something that seems creatively appealing or mentally challenging. Unfortunately, according to the MBTI® Manual INTPs, along with INFPs, were the most dissatisfied with the work they do, where they work, and future work opportunities. Many careers don’t offer the autonomy, flexibility, and originality that these two typesThe crave. Occupational trends for INTPs include scientific and technical fields. INFPs more than anything want a job that aligns with their values and allows them to be creative and original. This is likely why many of them are drawn to the arts and writing! They are independent workers who value autonomy a great deal. While they care for people, they don’t want to spend all their time in a busy office place. Their privacy is very important to them. They like a variety of tasks, and are usually de-motivated by repetitive, detail-oriented work. Unfortunately, according to the MBTI® Manual INFPs, along with INTPs, were the most dissatisfied with the work they do, where they work, and future work opportunities. Many job opportunities don’t provide the autonomy, creative outlets, or flexibility that INFPs crave. This may be why many INFPs work from home or are drawn to entrepreneurship. Occupational trends for INFPs include counseling, writing, and the arts. ENTPs want a job that allows them to be creative, original, and highly independent. They don’t mind taking risks or skimping on job security if it means they’ll have the opportunity for higher pay or more challenging, creative work. Many ENTPs are drawn to entrepreneurship because this allows them to do a variety of tasks, work autonomously, and go after achievement without having to focus on someone else’s agenda or rules. In fact, ENTPs are overrepresented among working MBA students. Occupational trends for ENTPS include science, management, technology, and the arts. ENFPs want a career that allows them to work independently, creatively, and with a team of people from all walks of life. They aren’t interested in routine, detail-oriented work. Instead, they favor work that allows them to do a variety of tasks in a variety of environments. They are often drawn to international opportunities, but also are strongly motivated by community service, learning, and friendships within the work environment. ENFPs ranked lowest of all the types in liking work environments where “Everything is done by the book”. These original individuals like to do things in new and innovative ways and tend to eschew to tried-and-true method. Occupational trends for ENFPs include counseling, teaching, religion, and the arts. This is a great post and seems very accurate to me! Will be sharing!